The Power Meter (K.O.ゲージ, K.O. Gauge) is a passive ability unique to Little Mac in Super Smash Bros. 4 and Super Smash Bros. Ultimate that is shown above his damage meter. It is filled as Little Mac takes or deals damage (even to shields), and each level of charge (represented by the color of the bar) plays a soft, specific sound to notify the player of its charge. Once the bar is full, a loud bell sound reminiscent of those in a boxing ring plays, and the bar becomes a flashing "K.O." sign, causing his neutral special move, the Straight Lunge, to be replaced with a powerful move named the KO Uppercut. While intended to be a one-hit KO per its name, its base knockback is not quite high enough to OHKO at 0%, and reaches KO potential at about 30% when performed on the ground, although this is dependent on the weight of the character; the lightest character, Jigglypuff, can start getting KO'd at 12%. The meter is emptied when the KO Uppercut move is used, successfully or not, and immediately empties once the player presses the special button, meaning it can be depleted if the player spams the special button during hitstun. The meter will also be emptied if Little Mac is KO'd, takes a hit that causes him to tumble (except for the first four seconds after reaching full meter), or traverses through a door in Smash Run. When Little Mac is inhaled by Kirby, Kirby copies Straight Lunge, but does not gain a Power Meter and so does not get the KO Uppercut move. When Little Mac transforms into Giga Mac, the power meter disappears for the entire duration of the Final Smash. 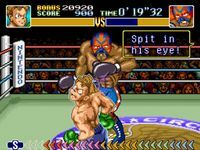 The Power Meter as seen on the bottom in Super Punch-Out!!. The Power Meter appears in the Punch-Out!! series, where successfully landing punches to Little Mac's opponents fills the meter up, while getting hit decreases the meter. Once the meter was full, Little Mac can perform a powerful knockout blow to his opponent. In Mike Tyson's Punch-Out!! and the Wii game, the meter was replaced with the Star Punch System. Close-up of a partially filled power meter. Fully charged power meter being used to attack Samus. When the KO Uppercut is successfully used, the camera will briefly zoom in on the move, similar to what happens for a Final Smash. Thanks to the Power Meter filling up when he takes damage, Little Mac can abuse the super armor of his smash attacks to plow through situations that would normally OHKO him or other fighters and fill up his Power Meter immediately: examples include hitting four Blast Boxes at the same time with a smash attack, sending him to high percents but keeping him alive with a full KO Punch ready. The sounds that play on each charge level are so soft that they're impossible to hear under normal circumstances, except for the 10th charge level. If Little Mac is hit with quiet moves like Confusion while the game is in slow motion, the sounds can be heard clearly. There is an unused KO Uppercut animation for Giga Mac.